Locally produced visitor tips, maps, guides and more. Get the most from your trip. With all this great weather people are to planning their trips down the Russian River. 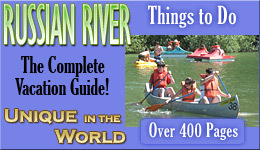 Check out our canoeing and kayaking section for the resources you need. Tubes can be purchased at Country Tire in Guerneville. They charge $22.50 for a large tube, and $15 for a small tube - they don't offer rentals. Johnson's beach does rentals but they don't allow you to go off with them, you just have to float around there. All the pictures on this website were taken from locations anyone could walk to (and many of them required no walking). There is an abundance of photo worthy scenes at every turn. It is not necessary to visit one of the parks to get pristine nature shots (the above picture was taken along a bridge just north of Monte Rio). A time honored tradition along various smooth gravel covered banks of the Russian River. There are several location that offer camping alongside the river. Sorry, we can't tell you where these are :). Finding them for yourself is half the fun. Don't worry though, it is hard to miss the guys flying out off the trees and splashing into the River. Don't forget your beach towels and suntan (or sunblock) lotion. There are plenty of fishing opportunities on the Russian River. Popular year round challenges include large and small mouth bass, bluegill and catfish. Several public access beaches are make perfect locations for convenient fishing. Herons, osprey, and hawks are some of the birds you will find along the river. With a little patience you may see one dive from the sky into the river and come up with a fish. View our events calendar page to find out what is going on when you will be here. Popular locations include the Healdsburg Memorial Beach, Johnson's Beach in Guerneville and the Monte Rio Beach. All three of these locations are great for families. There are also many campgrounds and lodges with property and private beaches on the river. Play on the Russian River does not stop at the water. Wine & cheese tasting, picnicking, horseback riding, events and much more are well developed tourism attracts with much to offer. Click here to view the complete Things to Do resource page.